CITGO SUPERGARD Motor Oils are premium quality engine oils designed to provide optimum performance in high-output gasoline (including turbocharged and supercharged) engines in passenger cars, vans, sport utility vehicles, and light trucks. The new technology incorporated in this latestgeneration lubricant enables it to exceed manufacturers' performance requirements. These engine oils demonstrate improved performance in today's advanced engine designs. 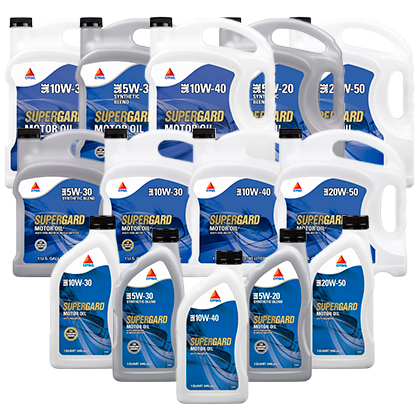 CITGO SUPERGARD is available in both single and multigrades. The SAE 5W-20 and SAE 5W-30 are classified as synthetic blends. Recommended for passenger cars, sport utility vehicles, and light trucks operating on gasoline. Also recommended for use in gasoline engines which have been converted to operate on compressed natural gas (CNG), liquified natural gas (LNG), and liquified petroleum gas (LPG-which includes propane and butane). NOTE: CITGO SUPERGARD Motor Oils are not recommended for use in diesel engines. CITGO CITGARD® Motor Oils are recommended for diesel applications.